The model is suitable for central venipuncture of internal carotid vein and subclavical vein and peripheric venipuncture (arm veins) of cephalic vein. 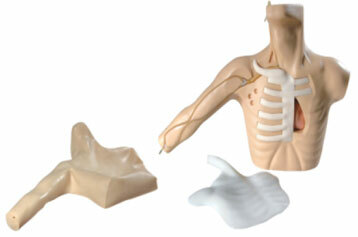 The cervical veins and arm veins can be filled with simulative blood. clavicle, suprasternal notch, stemocleidomastoid muscle, pectoralis major muscle, ribs and deltoid muscle. Lifelike veins: Superior vena cava, internal jugular vein, subclavical vein, cephalic vein basilic vein and median cubital vein etc. With apparent anatomical marks, the model can be used to train puncture and catheterization of internal carotid vein, subclavical vein, cephalic vein and heart catheterization. The skin and veins can be replaced, Students will feel an apparent "POP" when puncture needle has been thrust into the veins.